This verse can be read on the back of the warm up shirts of every St. John’s Eagle’s girls and boys basketball player this season. It reflects the attitude of the four teams who represented the mission, vision, and values of St. John’s during the 2018-19 season. St. John’s was blessed to have teams of 4th and 5th grade girls, 5th grade boys (SJ White), 5th & 6th grade boys (SJ Blue), and 6th/7th/8th grade girls represent our school on the court. The final tournament for both boys teams was at Trinity Freistadt. The tournament was full of tough competition, but SJ Blue brought home the trophy for second place. In addition, Trinity also awards one boys and one girls team a trophy for best sportsmanship. This award is voted on by the officials following each game and reflects the behavior of the coaches, players, and fans of each school. 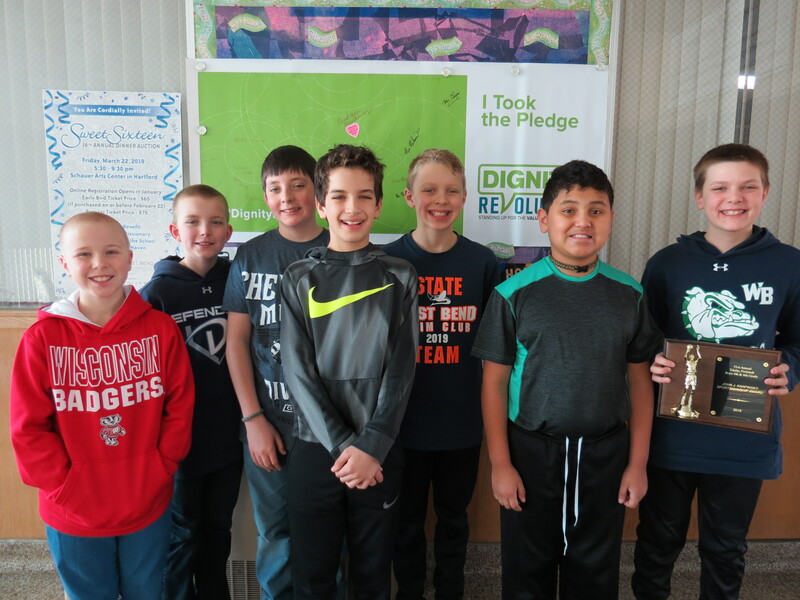 Our St. John’s Blue Team was awarded the Boys Sportsmanship Trophy. Receiving this award highlights the mission of St.John’s Educational Ministries, specifically “Nurturing Faithful Disciples” and “Equipping Christian Leaders.” The values the students are learning each day are carrying over into their extra-curricular activities.